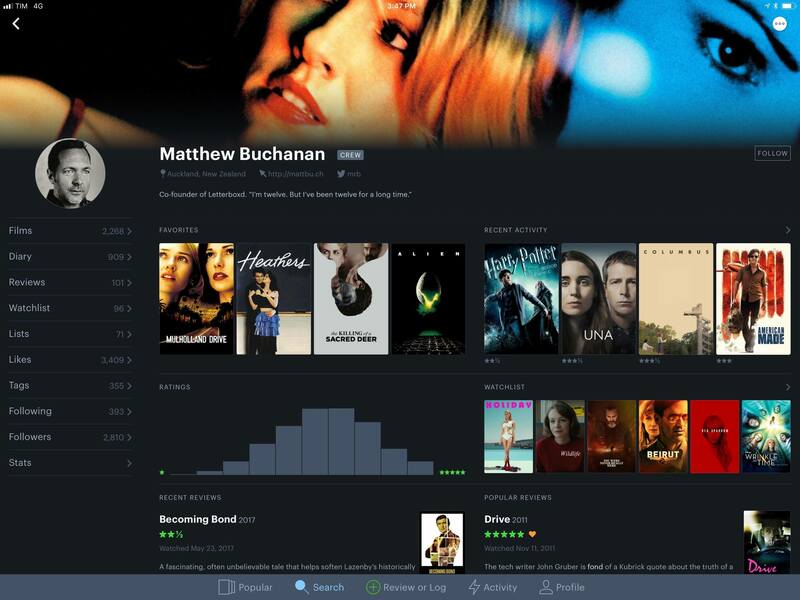 I've always been fascinated by Letterboxd, the popular service to catalog and rate movies you've watched, as well as share your appreciation for the art of film with other users in a social network-type environment. My problem, however, is that dedicating serious time to watching quality movies (instead of whatever is on TV) has mostly been an aspirational effort; I never truly attempted to make a list of films I want to watch and set aside a good chunk of time every week to enjoy them. Among various "quality of life" improvements (which I briefly mentioned in this episode of Analog(ue) with Myke Hurley), earlier this year I decided to create an Airtable database with a list of movies I want to see, trying to tick one off at least every week. Since I started testing a beta of Letterboxd 2.0 for iOS last week though, I'm wondering if maybe now is the time for me to consider using a dedicated service to collect, rate, and discover movies. Launching today on the App Store, the most notable change in Letterboxd 2.0 is the addition of a native iPad app. 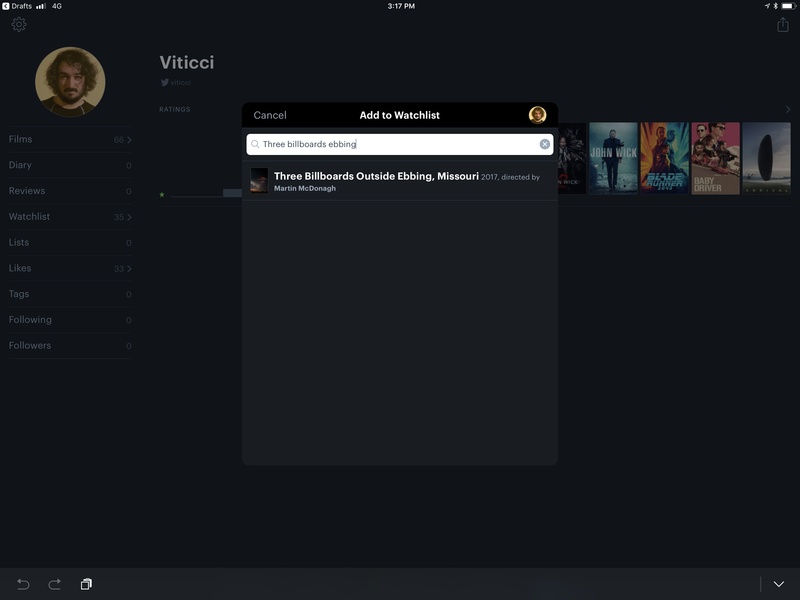 Based on the same principles and structure of the iPhone version, navigation in Letterboxd for iPad happens primarily via five tabs at the bottom of the screen; unlike the iPhone app, these tabs are labeled and easier to identify at a glance. Thanks to the larger canvas, every UI element in the app is bigger and more comfortable to interact with – which is unsurprising – but the Letterboxd iOS team also took the time to rethink how other controls should be laid out on the iPad's screen. In the Profile page, for instance, links to open sections for films you've rated, your likes, and watchlist have been relocated to a sidebar; when you open a movie's individual listing, the iPad app shows larger cover art at the top, followed by a bigger movie poster than the iPhone version, with ratings and other actions grouped together on the left, leaving room for reviews and other useful information in the main view on the right. One day, I'll be like Matthew. One day. This was no small task. Some screens from the phone app just made sense larger (browsing grids of popular films) or presented in a popover (sorting and filtering options), while others (like member profiles) required more of a rethink. The results are glorious—our Patron profile pages have never looked so good! With three iPad resolutions and two orientations to consider, we’ve concentrated our efforts on the most commonly used views in the app, and we’ll continue to refine ancillary screens in future releases. While browsing the Letterboxd iPad app in full-screen feels good, I'm particularly happy to see the company has embraced modern iPad multitasking too. Letterboxd fully supports Slide Over, Split View, and basic drag and drop for text fields (such as the search one); I'm going to be using Letterboxd next to apps like Safari or iTunes when I'm browsing around looking for movies to add to my watchlist, and I'm glad I won't have to switch between multiple spaces to do so. In addition to making the iOS app Universal, version 2.0 of Letterboxd has also adopted the x-callback-url protocol to support inter-app automation through URL schemes. As detailed in the documentation available here, Letterboxd 2.0 supports three different actions: search (to perform a search on the service and filter by results by film, member, list, and other parameters), addToWatchlist (fairly self-explanatory), and log. With the latter, you can add a new entry to the app (either a review or a personal diary entry), pre-filling key details such as a movie's title, date, and review from other apps, sending a request directly to Letterboxd's compose window, which will populate each field based on what has been passed by the URL scheme. A search for a movie that started in Drafts. After confirming a result, it will be added to your watchlist in Letterboxd. For years, I've seen iOS users create workflows to log watched movies or archive reviews in note-taking apps that supported a rich URL scheme or web APIs, such as Day One (a popular choice for this task given its diary nature) or the aforementioned Airtable. With a URL scheme, Letterboxd can now be integrated with Drafts and Workflow on iOS, which opens up interesting possibilities as the log action supports HTML content in the review field. This means you could write a review in a Markdown environment like Bear and Ulysses, then use a workflow to convert it to HTML and send everything to Letterboxd, retaining formatting and content for other fields as well. The Letterboxd team has created some sample actions and workflows you can find here. As I said above, I'm not a movie expert, but I want to discover and watch more movies in 2018. 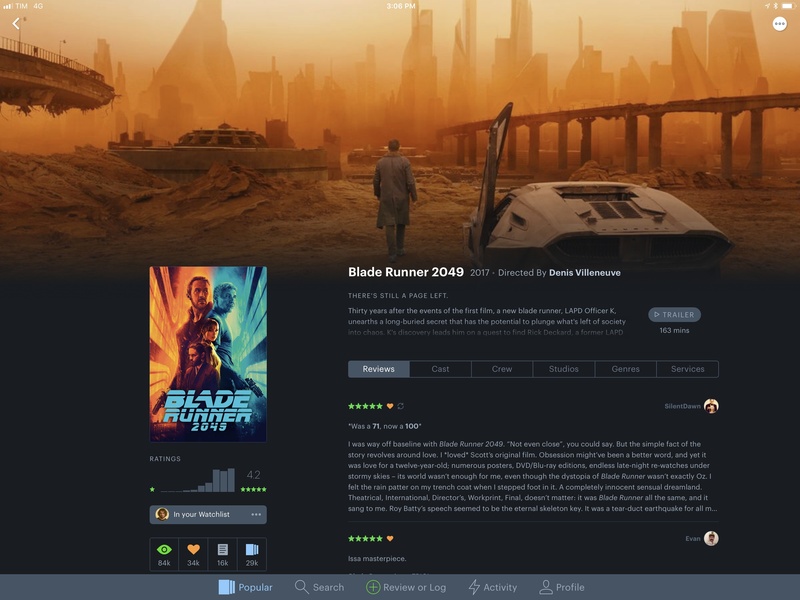 Letterboxd – which also offers two types of premium subscription on its website – is a thriving community with hundreds of thematic collections and excellent recommendations by movie aficionados who are passionate about this industry and art form. With an iPad version, Letterboxd now provides a rich and modern iOS experience that, hopefully, will help me grow my movie knowledge over the next few months. Letterboxd 2.0 is available on the App Store.